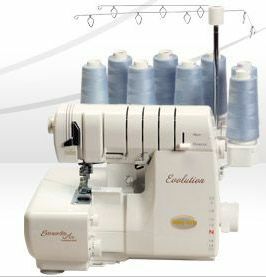 The Skyline S7 sewing machine comes with 240 built-in stitches, including 11 one-step buttonholes and 7 alphabets. You can now enjoy the AcuFeed Flex™ Layered Fabric Feeding System and the Automatic Presser Foot Lift. The 11 buttonholes can be customized for stitch width, stitch density and buttonhole opening. Along with that, the 7 alphabets also go up to a 9mm width with a revised letter size and shape for increased realism and balance. Navigation through all of these features has become easier with the Skyline S7’s new LCD color touchscreen. One of the amazing things you can do with the Skyline S7 is create your own stitches from scratch with the Stitch Composer Stitch Creation Program. Using your PC, this software will allow sewists to quickly transfer their own stitches to their Skyline S7 machine. 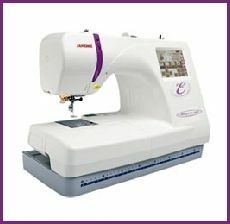 Once they are in the machine, you can select and sew with them just like you would with the built-in stitches. 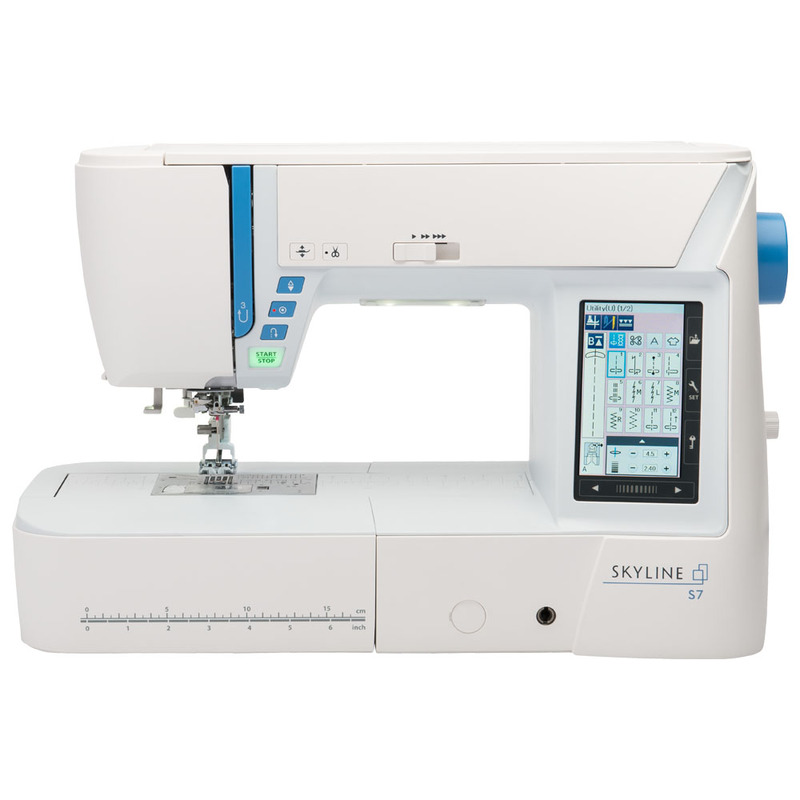 The Skyline S7 is the perfect machine to start your next sewing project. It will be available only at starting on Saturday, September 5th. This Skyline S7 joins the Skyline S5 in the Janome line-up. 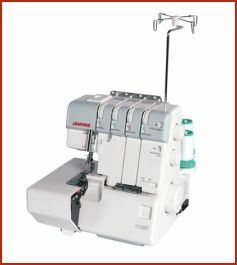 To learn more about this new Janome machine click here. This entry was posted in New Products and tagged janome, new products, sewing machine on September 6, 2015 by Designs by Marje. Sewing for Girls and their Dolls. How many of you have daughters or granddaughters that have an American Girl doll? If so, do the girls like to dress like their dolls? I know that I have a few granddaughters that like to have matching dresses for themselves and their dolls. I’ve spent many hours creating the outfits for them. Nancy Zieman recently had a “you tube” video on the subject. I thought that I would share it with you. Nancy shows you how to use an open toe foot to stitch ribbon to fabric; she uses a special “pinning” technique. She also demonstrates how to use the ruffler foot. This entry was posted in Video Library, Videos: Notions & Accessories Tips, Videos: Sewing Tutorials & Tips and tagged clothes, dolls, Sewing FYI, sewing machine on September 11, 2011 by sewvacoutletblog. Hi, I’ve just returned from BabyLock Tech where I learned some many new and interesting things, not just about sewing, quilting, and embroidery but more importantly how to keep our customers, friends, and followers informed about sewing, quilting, and embroidery. So, while on the plane home, I thought about changing our blog. Instead of telling you want is happening at the store, we are going to use the blog to give you tips, techniques, with answers to the How to questions, a Did you know section, and news about new products, updates on existing products and so much more. We are open to your suggestions and ideas on how to make a blog a useful tool for you. We invite you to join us on our new exciting journey on the internet with our blog, our facebook page, and twitter. Thank you for your interest and for your support. This entry was posted in News and tagged babylock, embroidery, houston, janome, sewing machine, singer, texas, viking on August 31, 2011 by sewvacoutletblog.